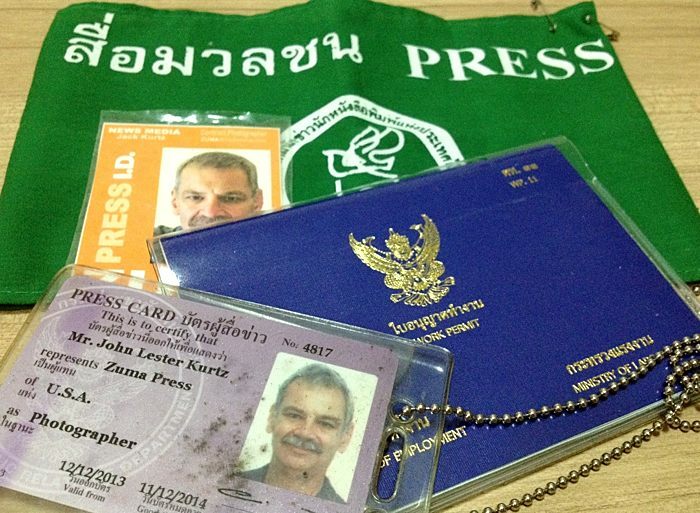 My various credentials - my Thai government credential (purple foreground), my Thai Work Permit (blue), my US press card, which is widely accepted here (orange) and my Thai Journalists' Association arm band (green). I'm now officially a photojournalist accredited to work in Thailand. Many of the foreign journalists who live here do it in a sort of a gray market way. They're not exactly working illegally but they're also not exactly working legally. They have a long stay multiple reentry visa that allows them to stay in Thailand for a year but they have to leave the country every 90 days. These 90 day trips are called "visa runs" and they're a part of the routine of living here. I was on one of these long stay multiple reentry visas last year and made a couple of trips to Cambodia, trips to Laos, Myanmar and Singapore for my visa runs. I've worked on immigration stories for more than 20 years from both sides of the US / Mexico border. I've worked on immigration stories in Guatemala, Mexico and Thailand (in Thailand, it was stories about Burmese and Cambodian immigrants coming to Thailand, not Thais going to the US). Working in Mexico I always had a journalist visa. In Guatemala I didn't (technically I was in Guatemala "illegally" but that's another story), in Thailand I never had a journalist visa but my immigration papers were always correct and I stayed within the letter of Thai immigration law. As last year's experiment with being a photojournalist in Bangkok went on, it became clear to me that I wanted to get a journalist visa. Not because I couldn't function without one (most of the photographers working here don't have the type M media visa and never have a problem) but because it felt hypocritical for me to be working as a journalist without the right papers. We expect immigrants coming to the US to work within US immigration laws. It's only fair, I think, that US citizens should be expected to work within Thai law. That said, getting the journalist visa took a fair amount of paperwork and several trips to Thai government offices. First I had to send an application to the Thai Ministry of Foreign Affairs. Once they received my application, I had to go to the Thai Consulate in Los Angeles for an interview and to apply for my visa. I didn't know if the visa would be approved for several days after the interview. I left my passport at the Consulate pending approval of my visa. A single entry 90 day M visa was approved and my passport mailed back to me. When I got back to Bangkok, I had to resubmit all of my paperwork to the Ministry of Foreign Affairs along with my proof of arrival in Thailand (a photocopy of the entry stamp in my passport) where they reviewed my request. Once my request was approved (a process that took two weeks), I had to go the Immigration One Stop Center and get a Thai Work Permit, Visa Extension and Multiple Reentry Permit. That took all day and required a medical exam to ensure I didn't have any chronic diseases or mental illness. Once I had my Work Permit and Long Stay Visa, I had to go to the Public Relations Department and get a Thai Press Card. I walked out of the Public Relations Department this morning with my Press Card and a sense of satisfaction bringing a three week process (since I arrived back in Bangkok) to a close. The process seems complicated but the Thai government officials I dealt with explained exactly what was needed at the beginning of the process and with all my forms and letters in order the process went just as they said it would. From time to time I wondered if it was worth all the hassle and time but as complicated as the process seemed to me, it's still a lot easier than the process Thai nationals hoping to visit the US have to go through to get a US visa.